SCADDING, HENRY, teacher, Anglican clergyman, and historian; b. 29 July 1813 in Dunkeswell parish, England, youngest son of John Scadding and Melicent (Melly) Triggs; m. 14 Aug. 1841 Harriet Eugenia Baldwin (d. 1843) in Toronto, and they had one daughter; d. 6 May 1901 in Toronto. 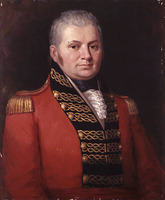 John Scadding, a farmer close to John Graves Simcoe*’s home in Devon, came to Upper Canada with Simcoe in 1792, was employed as a government clerk, and was granted land. Having returned to Devon with Simcoe in 1796, he later became manager of Simcoe’s estate, but in 1818 he came back to, Upper Canada and in 1821 brought his family to his home near York (Toronto). In 1822 eight-year-old Henry Scadding entered the Home District School under John Strachan*, whose protégé he became after his father’s death in 1824. In 1830 Henry was the first pupil enrolled in Upper Canada College in York, and in 1833, through the generosity of Mrs Simcoe [Gwillim*], he went to St John’s College, Cambridge, from which he graduated in 1837. He would later receive an ma (1840) and a dd (1852) from Cambridge and a dd (1867) from Oxford. Scadding returned to Canada on 28 May 1837 and was ordained deacon in Quebec on 4 June. Strachan hoped he would be a travelling missionary, but Scadding had received an unspecified “hurt” in England that made such work impossible. 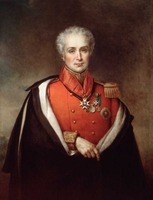 He spent almost a year in Lower Canada tutoring Sir John Colborne*’s sons, and on 5 Sept. 1838 was appointed a classical master at Upper Canada College. After his ordination as priest on 7 October he served at St James’ Church, Toronto. From 1840 he was Strachan’s domestic chaplain and in June 1847 Strachan appointed him incumbent of the new Church of the Holy Trinity in Toronto. In 1853 William Stewart Darling was appointed assistant minister at Holy Trinity to undertake “the greater portion of the Parish duties” because of Scadding’s “feeble and delicate health” and his employment at Upper Canada College. Scadding’s health continued to deteriorate; after 1862 he was rarely able to preach or officiate because of an “obstruction in the organ of speech.” He resigned from the college in 1862 and from Holy Trinity in 1875, when he was appointed a canon of St James’ Cathedral. Holy Trinity had been established with money from a benefactor in England on condition that its pews be free. 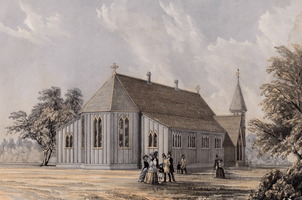 Intended to be the church of Toronto’s poor, it was also distinctly high church in its theological orientation, thus reflecting the concern of 19th-century Anglo-Catholics with ministry to the urban working class. 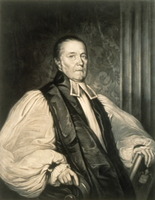 Darling was probably mainly responsible for incorporating such innovations as surpliced choristers, processional hymns, Gregorian plainsong, and altar candles into services at Holy Trinity, but Scadding, in his sermons, expressed full agreement with the essentials of the Anglo-Catholic message. Scadding was a decidedly quiet and temperate high churchman, however, remaining aloof from the various battles waged by the church’s high and low wings. In the election of 1879 for a successor to Alexander Neil Bethune* as bishop of Toronto, for example, he was so disgusted by the rigidity of the contending sides that he did not even bother to vote in the later ballots. Throughout his long life, Scadding published many pamphlets on literary, archaeological, and antiquarian subjects, but his keenest interest was in the history of Toronto. A founding member of the Canadian Institute in 1849, he was its president from 1870 to 1876; from about 1869 to 1886 he edited its Canadian Journal and then its Proceedings. His monumental Toronto of old: collections and recollections illustrative of the early settlement and social life of the capital of Ontario first appeared in the Canadian Journal from April 1869 to May 1873, when the revised text was “on the point” of publication in book form. Scadding consulted many written records, but his book is based mainly on his recollections, supplemented by those of other early residents; informal “séances” with them coincided with the founding in 1869 of what became the York Pioneer and Historical Society, which Scadding served as president from 1880 to 1898. Scadding’s purpose in writing Toronto of old was to commemorate the city’s first European inhabitants, particularly those with “high moral excellence and great usefulness.” He wrote almost exclusively about members of the ruling or professional classes and the government bureaucracy, as well as about worthy tradesmen and shopkeepers. He wanted to preserve their “characteristic sayings, doings, dress and demeanour”; his emphasis was thus on outward appearance rather than biography or historical significance. He was also uncritical, probably to present the pioneers most favourably, possibly to avoid controversy, as he had avoided it both as a teacher and as a clergyman. Scadding described amusing peccadilloes and harmless eccentricities, but not scandal or wrongdoing. Early Toronto is depicted without want, disease, squalor, or crime. Despite these limitations, Scadding’s book is not mere hagiography. In a leisurely, discursive way, he presents a series of extremely vivid pictures of life in early Toronto. There is much irrelevance, pedantry, and veneration of all things British, but his eye for graphic detail is excellent. Many of these vignettes are from a child’s point of view; many of the descriptive passages, such as that on the Don valley, are almost lyrical. Toronto of old should be used cautiously for fact; with access to many more primary sources than Scadding had, historians now know that he could occasionally be wrong. He himself wrote that he was recording “floating folklore.” The real value of the book lies in Scadding’s ability to revitalize the minute past. Toronto of old contains almost 600 rambling pages, but students of early 19th-century Toronto – or Ontario – ignore it at their peril. Henry Scadding’s most important work is Toronto of old . . . (Toronto, 1873); a reprint was issued there in 1878 and a revised edition in 1879. An abridged version entitled Toronto of old, edited by Frederick Henry Armstrong, was published at Toronto in 1966; a second edition appeared there in 1987. Scadding’s writings on Toronto also include “Memoirs of the four decades of York, Upper Canada,” in Henry Scadding and John Charles Dent*’s Toronto: past and present: historical and descriptive; a memorial volume for the semi-centennial of 1884 (Toronto, 1884), 1–122 (also issued as a monograph (Toronto, 1884), a copy of which is available at the MTRL), and his introduction to G. M. Adam, Toronto old and new: a memorial volume . . . (Toronto, 1891; repr. 1972). More than 70 additional publications by Scadding are preserved in the MTRL, which also holds his papers, including diaries, sermons, notebooks, and correspondence. Selections from Scadding’s diary were presented by his daughter Mrs Robert Sullivan [Henrietta Scadding] as “Extracts from a diary of the Rev. Henry Scadding, 1837–8” and “Further extracts from the Rev. Dr. Scadding’s diary, 1834–44 . . . ,” in the Women’s Canadian Hist. Soc. of Toronto, Trans., no.6 (1906): 3–32 and no.10 (1910): 7–34. AO, F 47; F 983, esp. letter-books, 1839–43, Strachan to Scadding, 3 May 1841; 1854–62, Strachan to W. S. Darling, 3 Oct. 1862. MTRL, Henry Scadding scrapbooks, vol.1; [John Scadding], account-book; John Strachan papers in the Henry Scadding coll. NA, MG 23, HI, 1. Univ. of Toronto Arch., A74-0018. York Pioneer and Hist. Soc. (Toronto), “Register of members . . . from the commencement of the society in 1869,” comp. W. H. Doel (1886), 13, 518, 524. Curtis Fahey, In His name: the Anglican experience in Upper Canada, 1791–1854 (Ottawa, 1991). 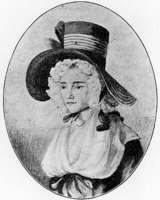 [E. P. Gwillim], Mrs J. G. Simcoe, The diary of Mrs. John Graves Simcoe . . . , ed. J. R. Robertson (Toronto, 1911; repr. 1973; [rev. ed. ], 1934); Mrs. Simcoe’s diary, ed. M. [E.] Quayle Innis (Toronto and New York, 1965). C. F. Headon, “The influence of the Oxford movement upon the Church of England in eastern and central Canada, 1840–1900” (phd thesis, McGill Univ., Montreal, 1974). A history of Upper Canada College, 1829–1892 . . . , comp. George Dickson and G. M. Adam (Toronto, 1893), esp. the chapter by Scadding, “The college, its inception, and its first masters,” 23–43. 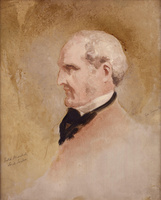 R. B. Howard, Upper Canada College, 1829–1979: Colborne’s legacy (Toronto, 1979). Desmond Neill, “Henry Scadding’s Toronto of old, 1873 and 1878: a bibliographical note,” BSC Papers, 17 (1978): 74–75. T. A. Reed, “A history of the Church of the Holy Trinity, Toronto, 1847–1910” (typescript, [Toronto, 1955]; copy at the MTRL); “The Scaddings, a pioneer family in York,” OH, 36 (1944): 6–20. F. N. Walker, Sketches of old Toronto (Toronto, 1965). Edith G. Firth and Curtis Fahey, “SCADDING, HENRY,” in Dictionary of Canadian Biography, vol. 13, University of Toronto/Université Laval, 2003–, accessed April 20, 2019, http://www.biographi.ca/en/bio/scadding_henry_13E.html.